The former major hurricane was still winds up to 50 mph as it crossed the I-26 corridor just northwest of Columbia Thursday morning. As of the Thursday 8 am advisory from the National Hurricane Center, Tropical Storm Michael was quickly moving to the northeast at 21 mph and expected to stay a tropical storm as it moves into North Carolina Thursday night. Forecasters then believe the storm will become extratropical, acquiring characteristics more resembling of a mid-latitude low pressure system, such as a Nor'Easter. Additional rainfall amounts of 1 to 2 inches are expected across the northern third of the state, with the highest totals possibly up to 3 inches likely falling in along the I-85 corridor of the upstate region, where the rain will linger the longest. It's not necessarily the rainfall totals that will cause flooding concerns, but rather the rate at which it falls. In most locations, the rainfall rates will be 1 to 2 inches per hour. The storm already has a history of producing flash flooding in the Greenville and Columbia metro areas. Before Michael leaves Thursday night, there is a tornado risk across far eastern sections of the state through mid-afternoon. 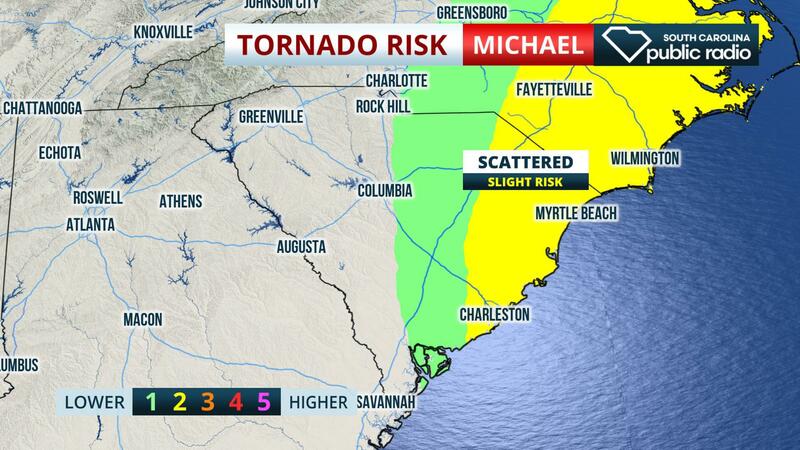 The risk is greatest near any outer rain bands that develop east of I-95 and north of Charleston. Tornadoes can spin up quickly from tropical storms, so residents in these areas are urged to stay aware and informed if the skies darken. 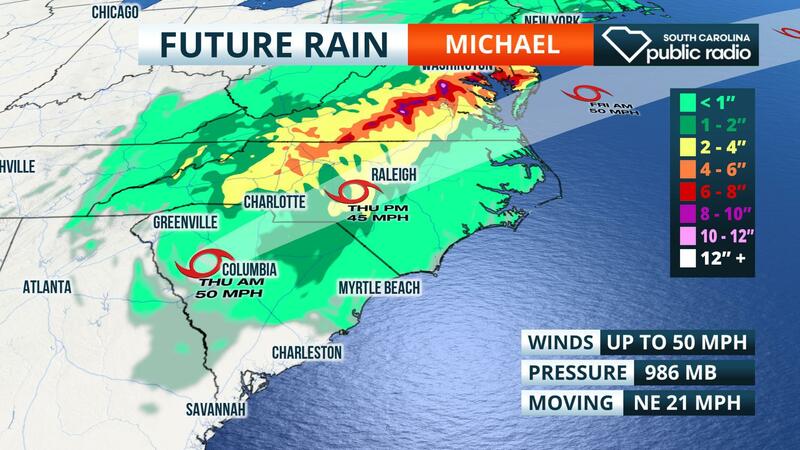 A Tornado Watch was issued for much of eastern North Carolina until 9 pm, where the risk for tornadoes from Tropical Storm Michael is even greater. All weather-related hazards from Tropical Storm Michael, other than the ongoing river flooding, will exit the state by Thursday evening. A cold front is forecast to follow the storm and bring temperatures and humidity levels down considerably over the weekend.